I hear the moaning cries of people hurting so. reuniting families again some day. Almighty Father allows his children to suffer and die. allowed his very own son to die. that my heartaches are a part of your great plan. in my time of need, and not resent them. give me the courage to accept what I can't change. leaving my doubting, weary soul darkened to sin. wallows in self pity and grows cold. 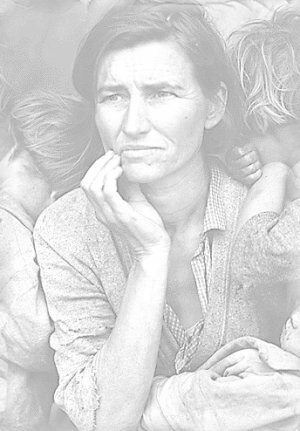 The graphics used above are from photos by Dorthea Lange titled "Migrant Mother".